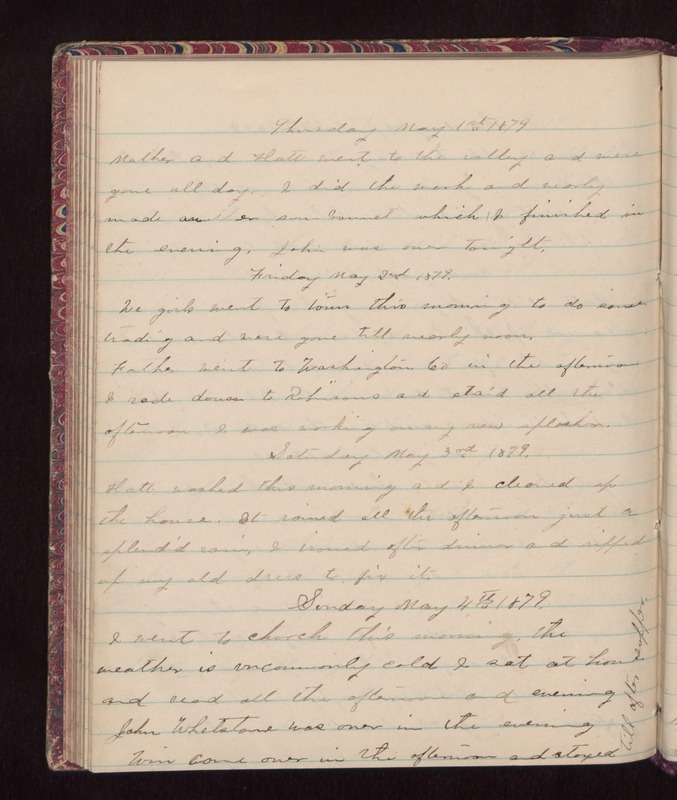 Thursday May 1st 1879 Mother and Hatt went to the valley and were gone all day. I did the work and nearly made another sun-bonnet which I finished in the evening. John was over tonight. Friday May 2nd 1879 We girls went to town this morning to do some trading and were gone till nearly noon. Father went to Washington Co. in the afternoon. I rode down to Robinsons and staid all the afternoon. I was working on my new splasher. Saturday May 3rd 1879 Hatt washed this morning and I cleaned up the house. It rained all the afternoon just a splendid rain. I ironed after dinner and ripped up my old dress to fix it. Sunday May 4th 1879 I went to church this morning the weather is uncommonly cold. I sat at home and read all the afternoon and evening. John Whetstone was over in the evening. Win came over in the afternoon and stayed till after supper.